Lupus diet includes foods rich in iron, omega-3 fatty acids, vitamins A, B, C, D, E and zinc but there are foods to avoid which can cause lupus flares. A person suffering from systemic lupus erythematosus SLE is not required to take a certain lupus diet. The most appropriate way of being well is still to have a healthy and balanced diet. Good nutrition is a very important ingredient in a general lupus treatment plan. Some vitamins and foods may be helpful for lupus patients. But there are also some foods that may cause lupus flares which make lupus symptoms very evident or active. Watch what you eat! 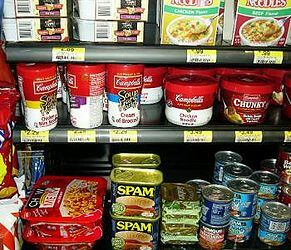 Processed foods trigger lupus flares. High proteins foods may prompt lupus flares in certain people with lupus. An excessive amount of protein intake can cause problems especially when you have kidney-related lupus since a protein-rich diet can lead to kidney organ complications. Other harmful foods for lupus are soy products which contain estrogen considered to be risky for lupus. Substances in alfalfa sprouts can start a lupus flare while coffee and tea beverages can decrease the iron absorption content of your body by half, eventually increasing the chances of having anemia which is a complication of lupus. Highly processed and preserved foods should also be avoided. Foods high in iron, conclusively, are very helpful to people with lupus. Examples of iron rich foods are leafy green vegetables, fish and lean meat like liver. These iron-packed foods, which also include breakfast cereals, reduce your risk of developing anemia. The omega-3 fatty acids found in salmon, sardines, mackerel include natural substances effectively decrease puffiness and tenderness related to systemic lupus. This suggests that someone with lupus to eat a lot of fish. Vitamins A and B as well as vitamin E and zinc should all be part of the lupus diet. Lupus patients need to avoid exposure to the sun that is why vitamin D from other sources are essential to SLE patients. Vitamin D also reduces the risk of having osteoporosis. The intake of calcium and vitamin D supplements may be recommended by your doctor to strengthen our bones. Vitamin C is a very reliable source of antioxidants and reinforces one’s ability to absorb iron. Any problem with managing of your lupus diet must be consulted to your doctor so that he can refer you to a registered dietician who can create a diet that will best suit your nutrition requirements. But one should remember that there are no difficult rules when planning a diet for a lupus patient like yourself. You should just be always aware foods that usually trigger your lupus symptoms. A lupus diet plan shall effectively help you control the symptoms of lupus as well as improve your general well being.